So we took the ferry to Sicily. 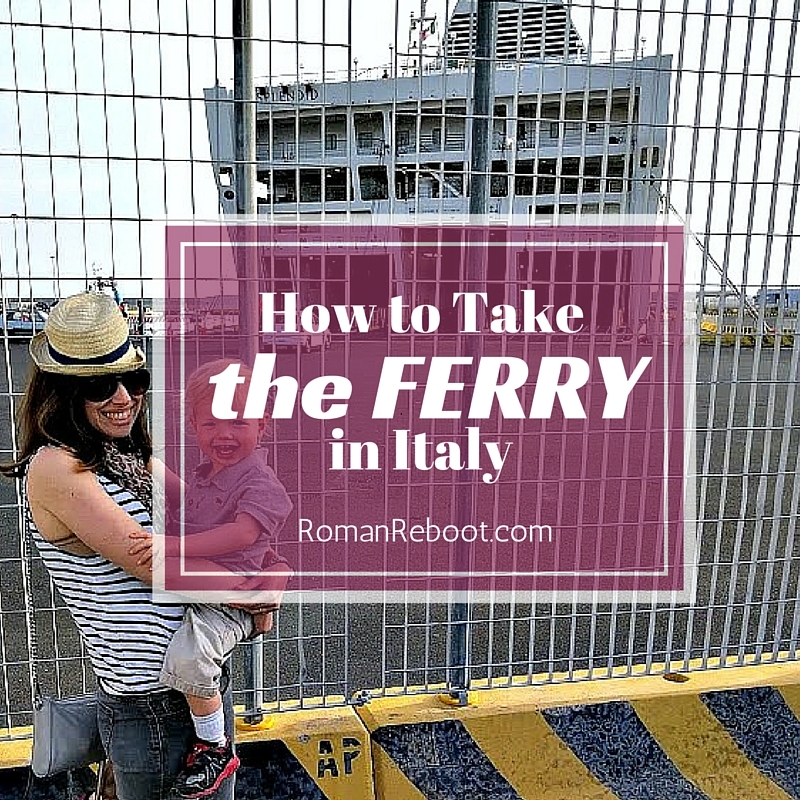 The 15-hour, overnight ferry to Sicily. Sounds crazy? Let me try to convince you why you might want to give it a try. If you decide to go for it, I’ll walk you through exactly how to do it. Depending on your trip, it might not, but I’d recommend crunching the numbers. 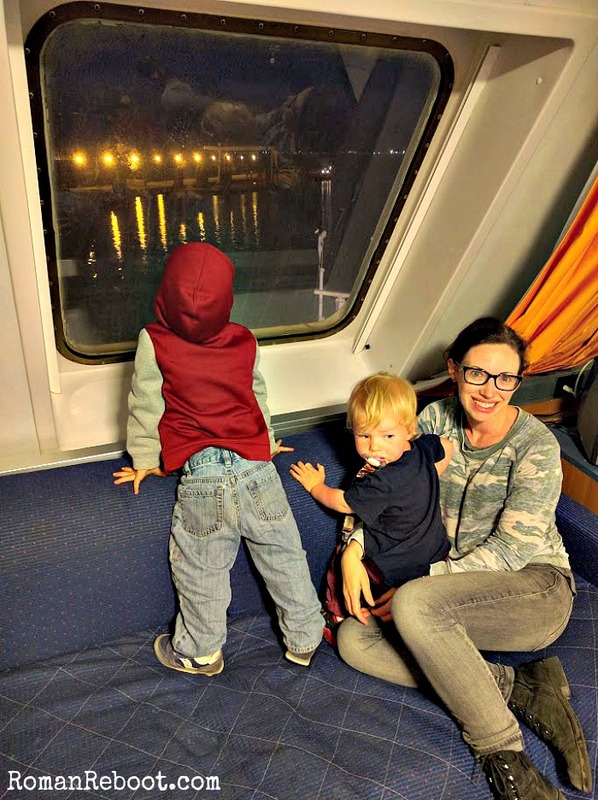 For us, we came out FAR ahead taking the ferry than we would have on booking airfare and renting a car with carseats for our family of four. That puts extra cannoli money in your pocket! Wait, didn’t you say you were on a boat for 15 hours? That doesn’t sound convenient. I hear you, but let me explain. At this stage in our life, getting to keep our own car was very convenient. We didn’t have to worry about packing in bags that would meet an airplane’s baggage allowance. We didn’t have to worry about any subpar carseats or even get used to different carseats. We didn’t have to deal with schlepping to the rental counter and chasing the children while checking out. We ESPECIALLY didn’t have to deal with the dreaded rental car cleanout at the end of the trip. This was huge. Cars are tough because kids are strapped down. Airplanes too because they seem to really want you to stay in your seat. Trains are a little better, but space is limited. On the ferry, however, you have a whole ship to explore. 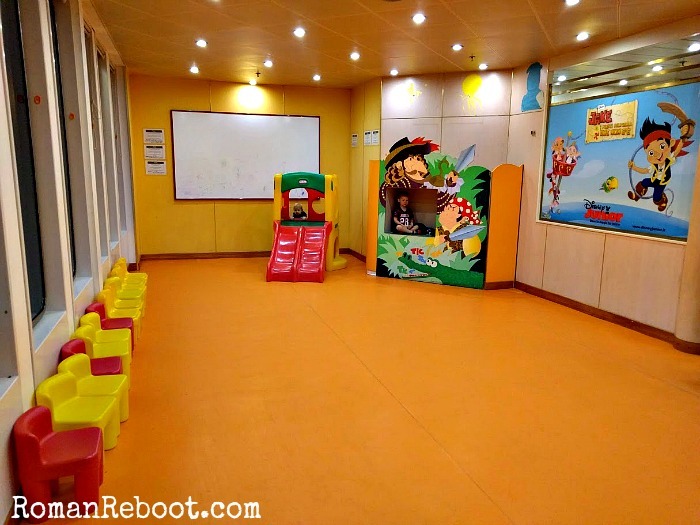 Kids can run, jump, and just move around. Between eating, sleeping, and just wandering, we found plenty to keep us occupied on the trip. If you only have a couple of days at your destination, it might not be worth cutting into your trip time on the ferry. I didn’t think the motion was bad, but you could tell that you were on a boat. Sometimes you felt not much at all. Other times you really noticed it. I woke up at 3:00 am one night and thought, whoa, we’re really moving. Coming into port with turning and reversing was its own kettle of fish. Overall, not bad at all. But it would bother you if you have motion sickness or sea sickness. We went into this with an Italian adventure mindset. For example, we knew we were going to the port, but we didn’t have a dock number or anything more specific telling us where to go. On one of our trips, announcements were made in Italian, German, and English. On the other, they were only in Italian and English. You apparently had to be out of your room by a certain time in the morning. On one trip they announced it; the other, not so much. Coming into port, we had an hour delay with no explanation provided. Everything worked out the entire trip, but if you feel better knowing exactly what is going to happen and when, this might not be the best for you. We just googled “ferries to Sicily” and found this searchable site. Once we assessed our options, we booked directly on the GNV website. 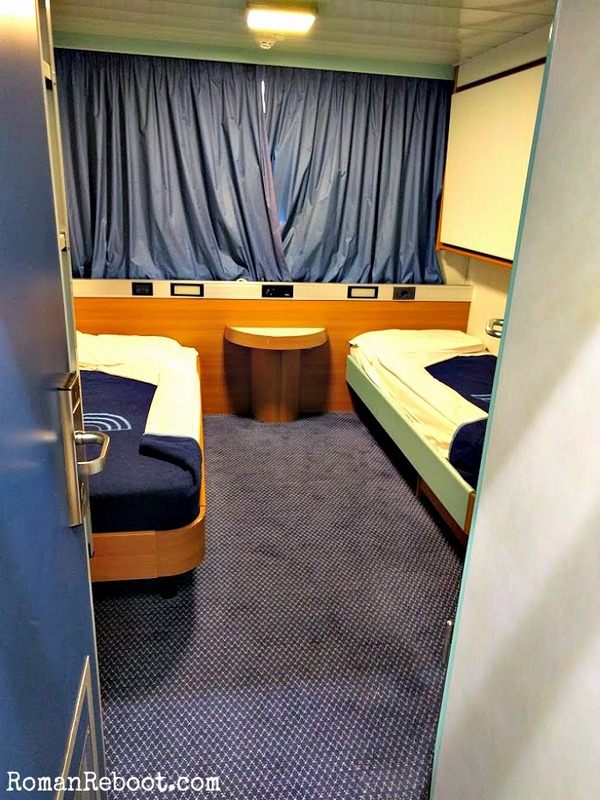 When booking, we had three options: Pullman Chair, 4-bed cabin (two single beds and two pulldown), or a “suite” with double bed and sofa bed. 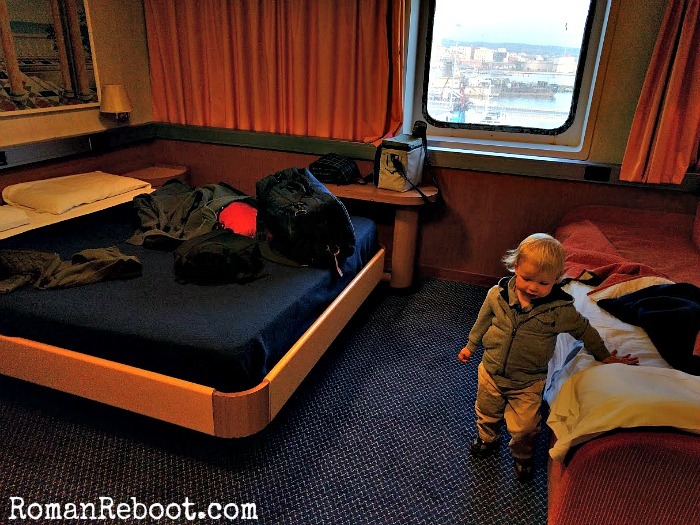 We opted for the suite with the idea that we would bring a travel crib for Mac. In the end, we decided the travel crib was too much trouble, and threw him in our bed. (We tried having him on the end of Henry’s bed, which we positioned on the floor, but they wouldn’t leave each other alone.) Sleeping bags would also totally work. The room itself was pretty nice. Bigger than some hotel rooms I’ve encountered. Best pillow of my entire trip. 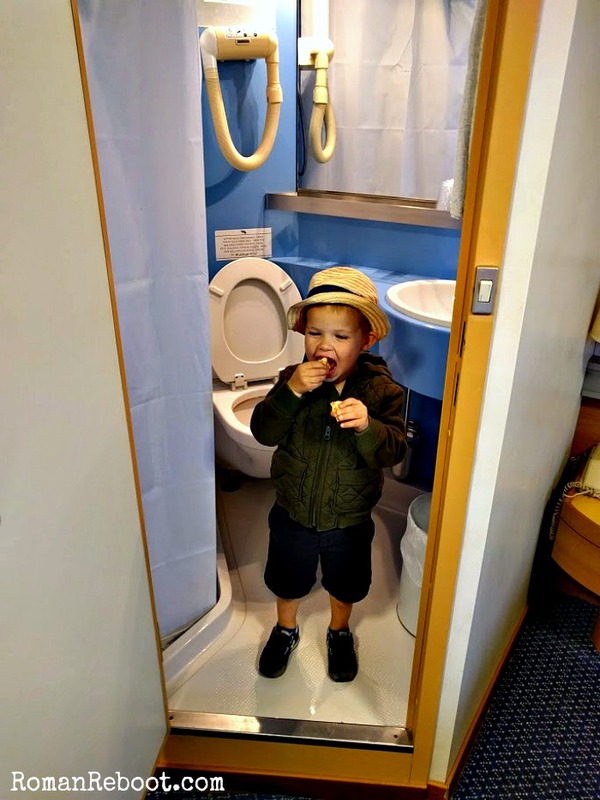 Tiny bathroom, but it is a ship. (We opted not to deal with the shower. If you felt like walking down the hall, the showers in shared bathrooms were much larger.) My main complaint was that one way our room smelled super smoky. Like you felt it oozing at you from the bed. On our return trip, this wasn’t the case at all. I’m guessing that certain sections of the ship used to be smoking, and the smell just lingered. When booking, you also select whether you are bringing a car, a pet, etc. Our ferry departed from the port at Civitavecchia. We drove there with VERY little information on exactly where to go. For example, we didn’t have a dock number or anything like that. Definitely allot additional travel time if you aren’t familiar with the situation. When we got to the port, it was a bit confusing. Ignoring shipping stuff and cruise ship departures, we kept heading toward the ferry departure signs. At one point, we had to drive through a security checkpoint. We showed the guy a copy of our ticket, and were on our way. Eventually, we found the row of ferries. Your ferry is labeled by departure. For example, we passed big “To Barcelona” and “To Palermo” signs before locating ours. Turn in when you find yours. This is important. We tried to skip this one. NOPE. Turns out your printout of your ticket is not what you need to board. Once you find your general ferry area, look around for some kind of Terminal. Here, you need to show your confirmation and you’ll get individual tickets for your car and passengers. Once checked in, move your car to the queuing area. Ours looked like four long lanes of traffic, but nobody was directed to get in a second lane so the first lane just kept getting longer and longer. You are supposed to be there two hours before departure. On one of our trips, we moved straight on. At our departure, we had to wait. People turned off their cars, stretched their legs, smoked. We watched them load up the ferry with new cars while we waited. When you get the go ahead, it is not an orderly procession. It was really whoever-can-get-back-in-their-car-first. We were handicapped by carseats and ended up at the back of the pack. I tried to tell myself it didn’t matter because we were all getting on the same boat, but it was still unnerving to have everyone blowing by you. While waiting, we wondered whether we would get to drive ourselves on or whether we would off-load and they would do it. Turns out, you TOTALLY get to drive yourself aboard. The kids didn’t seem to understand why James and I were so excited about this. WE’RE DRIVING ONTO A BOAT, YA’LL. Once you drive on, they direct you where to go. Our ferry was nowhere near capacity (I’d say less than a quarter full), but they still parked us close together. Fun fact: the car bay is locked down during the trip. That means you need to grab everything you need for overnight. They even made an announcement that they were locking and you needed to grab anything you need for your pet or child. I got that sense that they heard every excuse in the book. Doesn’t matter. You don’t go back. We packed a separate overnight bag for the ferry so we’d be able to grab and go. Of course, we were still the last out because we were rounding up diapers, jackets, toys, snacks, etc. But we would have looked SO COOL if we just popped out, grabbed one bag, and headed in. Maybe someday. We opted not to bring a stroller, but a small one wouldn’t have been ludicrous. There was an elevator on one part of the ship, it would have fit down the halls, and you would have had room in your room. 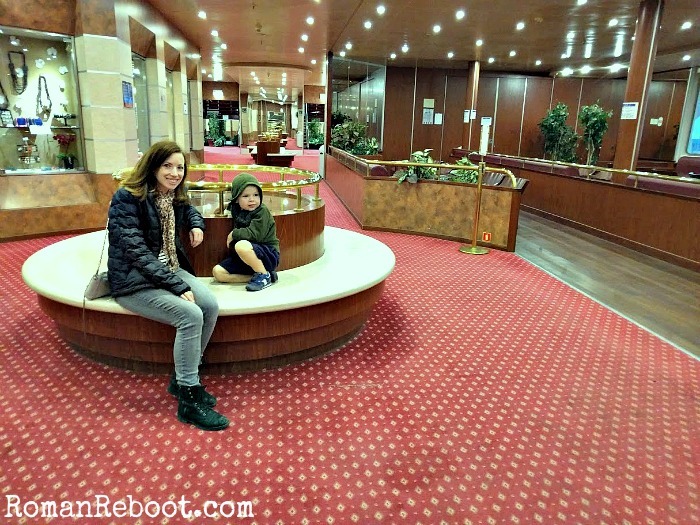 The kids loved exploring the ship, which looked sort of like a dated, small cruise ship. I’d say the ship simultaneously had both more and less than I expected on it. Either way, plenty to entertain us. For dining, you had a restaurant, cafeteria, and café (bar). (The gelateria was closed. As was the casino. Shucks.) The café was a fraction more expensive than those on the mainland. The restaurant seemed a little pricy. The cafeteria was mostly standard, but on the higher side. If you felt like bringing your own stuff, our room had a minifridge. The back of the cafeteria had microwaves, but these were stated to be “only for food purchased in the cafeteria” which makes no sense because if you buy food and have to immediately nuke it, that is a pretty crappy cafeteria. We were excited to see a kids room, but in reality it just had a slide and some chairs in it. There was a shop with souvenirs and toiletries. If you are poking around outside, the railings at the back of the ship are much more substantial than the ones on the sides. I wasn’t very worried about them falling overboard, but I felt more comfortable away from just the three-rail railings. Speaking of safety, they never had any kind of briefing or made an announcement. You did see signs from your room showing the way to your muster point. We were in Lifeboat Group A. They did make plenty of other announcements. Announcements about restaurants being open. Announcements about expected arrival. Other announcements I didn’t really follow (even though they were also in English). The announcements finally stopped at about 10:15 pm. They resumed at 8:30 the next morning. It turns out, you can’t just stay in your room until arrival. This was not communicated in the best way, but it seems like you should be gone about an hour before. They will knock earlier though. These guys wanted to turn the ship over FAST. They announced waiting points for you depending on your mode of departure. For example, we (Car Bay D) were to wait at the bar at the back of the ship. One way, we camped out on the floor in a corner. The other way, we hung out outside. Outside was much more pleasant. Once you get the heads up, you can reunite with your car. Driving off is not an orderly system in rows. Just whoever is there first. (Shocking I know.) 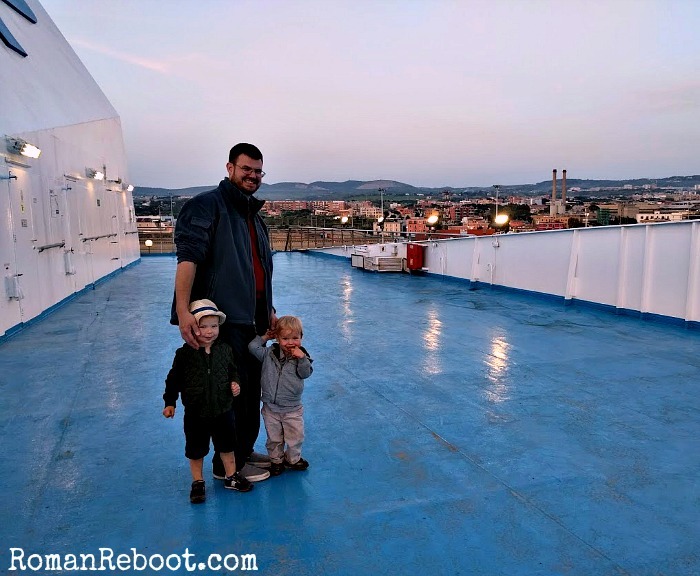 We drove straight off the ship and into our Sicilian adventure. Cannoli ho! So there you have it. 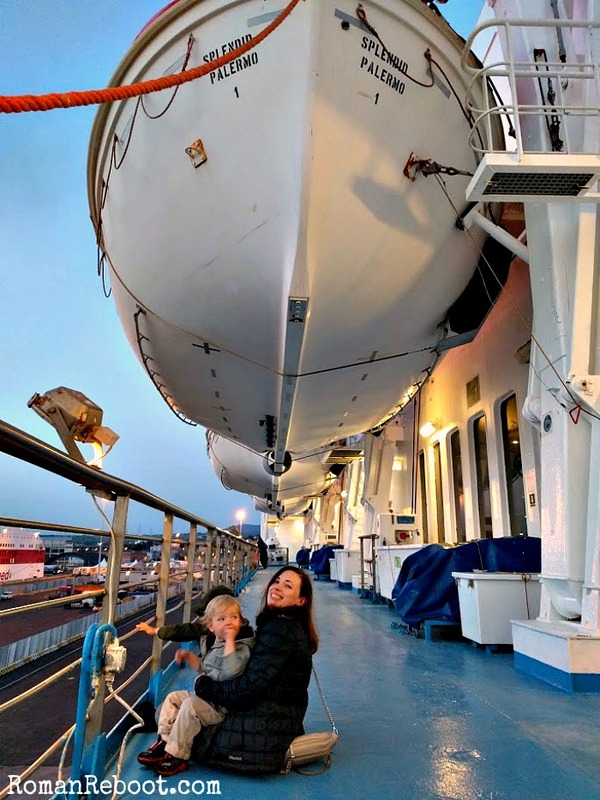 Ten easy steps to take a ferry voyage of your own. Anything I skipped you want to know? Anybody else tried the ferry? Any tips? This was a wonderful post! We went on a cruise ship out of that port (I’m not even going to try to spell it!). I love the details you gave for anyone wanting to do this. Thanks! 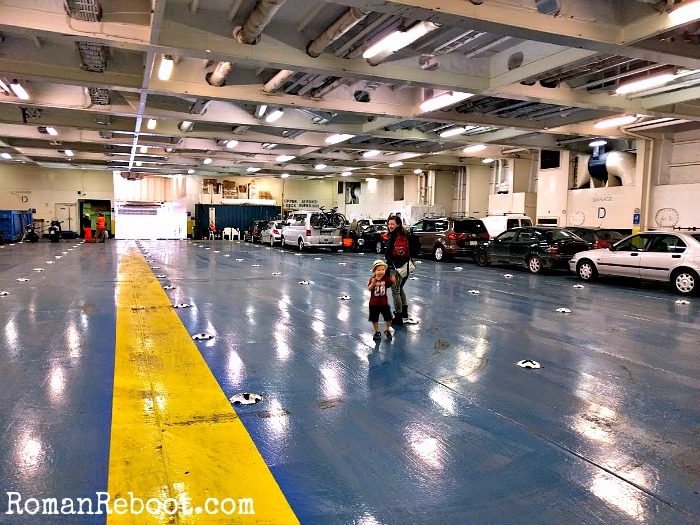 Maybe now that we’ve tried a ferry baby step, we’ll see about a cruise.